Ok! So I’ve seen all the recipes on pinterest about 2 ingredient pancakes that are so healthy! The problem is they don’t taste good! Check out this recipe that is DELICIOUS and HEALTHY! Not too many ingredients and I bet your kids will love it! What a great way to incorporate protein and nutrition into your family’s diet. I used very mature bananas and it came out perfect! The bananas were too yucky to eat by themselves, but perfect for this recipe! Also, I like using Designer Whey Protein or Visalus Protein Powder. Both taste great! 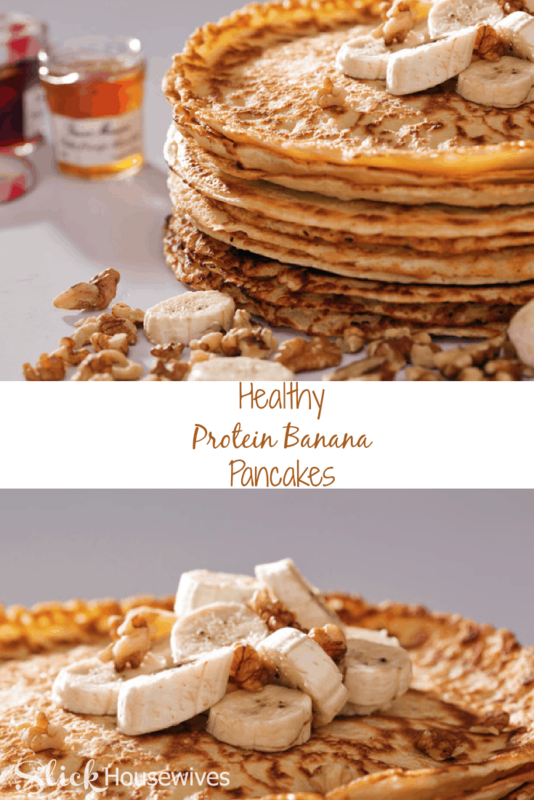 If you enjoy this Healthy Protein Banana Pancakes Recipe make sure to check out this cookbook that uses Protein Powder in the Recipes: Healthy, Low Fat and Packed with Protein! Spray a medium skillet or pancake grill with non-stick spray or coconut oil. Over low-medium heat add each pancake one at a time. Let cook for 2-4 mins on each side or until lightly brown on each side. Cook time depends on your stovetop. Drop by 1/4 cup onto a hot, greased skillet. Top with maple syrup, nut butter or preserves of choice.